How come it seems like the most popular business strategies are the most complicated? Your business brings in consistent revenue, and you’re ready to grow, but complex sales and marketing strategies are giving you the blues. Funnels definitely work, but require subscriptions and a VA to operate. Plus they are so delicate that one broken link can wreck the entire thing. Bots seem pretty cool, but you don’t want your clients to get a generic vibe from your customer experience. Your business is financially established, but you aren’t any closer to reaching your income goals and just aren’t ready to implement those popular strategies. Let’s uncomplicate things with a strategy that’s lucrative, effective, and simple. It’s time to build your profitable speaking platform. Speaking requires zero subscriptions, zero technology, and builds rapport and credibility faster than any other marketing practice ever could. 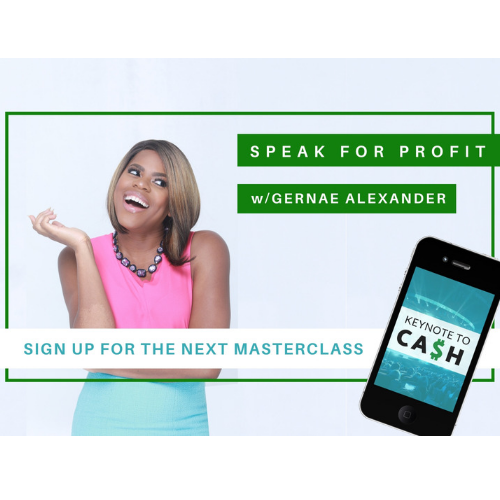 Explore how public speaking can multiply your income by joining me in my masterclass KEYNOTE TO CA$H. In this 90 minute session, you’ll learn 6 steps to building your speakers platform, the profit potential speaking can produce for your business and more. Invite your friends to join you in this LIVE experience, and I’ll be there to answer all of your questions. Have courage and uncomplicate things with speaking!